Who lovesHappy Hour? 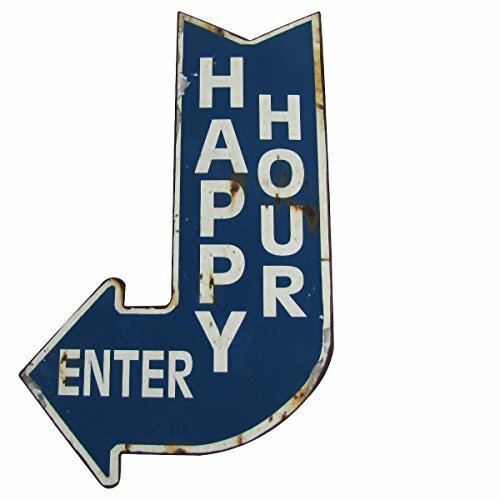 What a great addition to your tiki bar, home pub, kitchen, den, or man cave, this large vintage reproduction blue metal sign which reads: HAPPY HOUR ENTER, with arrow pointing to the left. The aged looking sign is brand new, made to look old with its distressed, rusty, and rustic appearance- it looks like it came right from an old bar. This HAPPY HOUR sign wall decor measures 22 1/2" tall x 14" wide with 2 sawtooth hangers on the back for easy wall mounting. The large curved arrow sign ships brand new in manufacturers packaging., with our 100% customer satisfaction guarantee. If you have any questions about this product by UDP,LLC, contact us by completing and submitting the form below. If you are looking for a specif part number, please include it with your message.